Summary: The description, specs, photo, pricing and user ratings for the Shooters Arms Mfg FX45 Fatboy Lightweight pistol. The Shooters Arms Mfg FX45 Fatboy Lightweight is a 1911-style semiauto pistol chambered in .45 ACP and built on an alloy frame. Features include a 1911-style slide and standard 1911-style controls. It carries an all-black, Novak-style rear sight, and a black post front sight with a white dot. Its magazine holds 12 rounds. 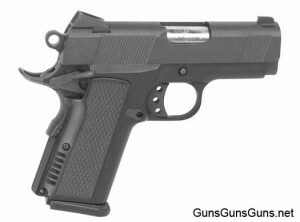 Note: American Tactical Imports (ATI) imports these pistols from Shooters Arms Mfg into the United States. This entry was posted in .45 ACP, $501-$750, American Tac Imports, Compact, Semiauto, Shooters Arms Mfg on October 23, 2012 by Staff.